There's something so addictive about hooking on a new rug. I was so anxious to get the next motif finished that I came back home from my afternoon off two hours early. After two years of being my mother's caretaker 24/7 we finally have some great help. Caroline seems to be able to talk my mother into anything - even taking a shower when she doesn't want to. So, I have no qualms about leaving the house and my mother in Caroline's care. I've been told I should get out of the house and go do something for myself - so, most Wednesdays, if I don't have lunch with a friend, I go up to the corner cafe, have a mocha caramel latte, and read the newspaper. Sometimes I work on a writing project (and try to pretend I'm J.K. Rowling working on something as wonderful as Harry Potter) but, today, I could hardly stand it. I read the local news in the newspaper - our township officials are always having a Hatfield and McCoy kind of vendetta going on - chatted with the hard-working cafe owner, and then I packed up my laptop and headed for home. I just had to finish that tennis court. 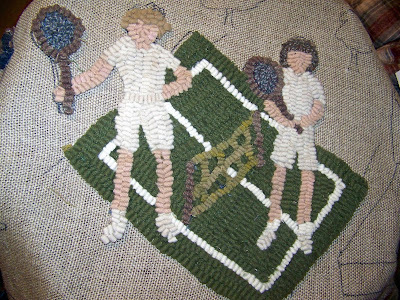 My tennis players have done something that I've seen happen in other rugs - something without planning, something surprising - and in this rug, that's the dimensional look of the tennis players, with the left player looking larger and therefore looking closer to the viewer. When you figure both figures were traced from cutouts that were exactly the same, it's hard to figure how that happened. It'll be interesting to see if that same look is still there after I hook in the background. Having a respite worker is very important to maintaining your own health. My mother is aging and while still independent at 77, I worry about her all the time too. I have always wanted to write the "great story" too and have a couple in progress. Your rug is gorgeous and I enjoy seeing your enteries of its progress.